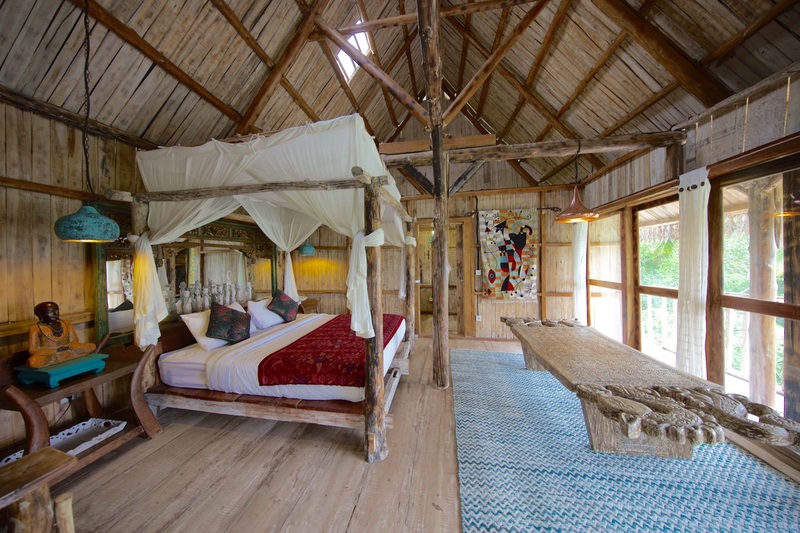 The Treehouse offers 3 King sized bed bedrooms including a loft, a lush outdoor bath-house style bathroom, several balconies and a treehouse bar. It can easily accommodate a group of 8 people. The many balconies off the Treehouse offer plenty of space for lounging and soaking up the views under the shade of old teak beams . ​ A large upstairs balcony offers additional living space, including a treehouse bar for breakfast or sunset cocktails. ​Downstairs, the front balcony offers a breakfast bar and casual seating. The large interior living area has sweeping and uninterrupted views of the rice fields to the west. It contains two large daybeds that can convert to single beds for sleeping. 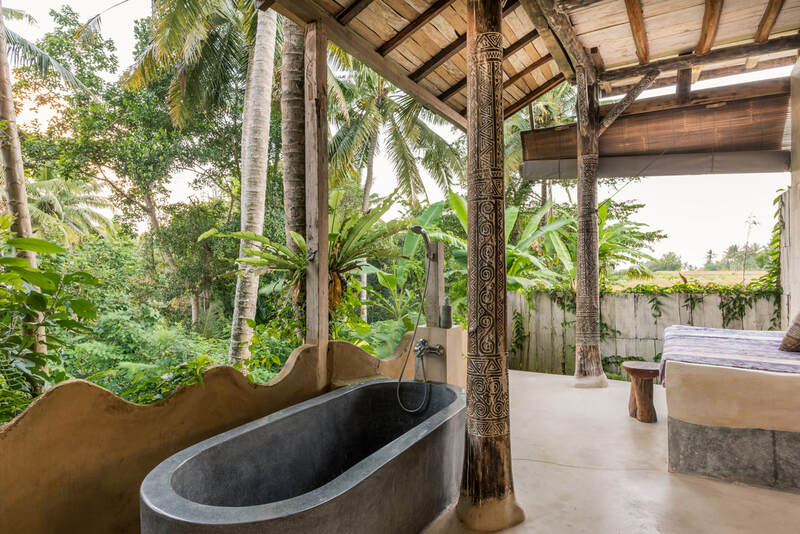 The open air bathroom at the back, overlooking the ravine, is designed in the style of a luxurious bathhouse. Take in the lush vegetation from the open air bath or the daybed overlooking the ravine. Upstairs, all the bedrooms offer expansive views. 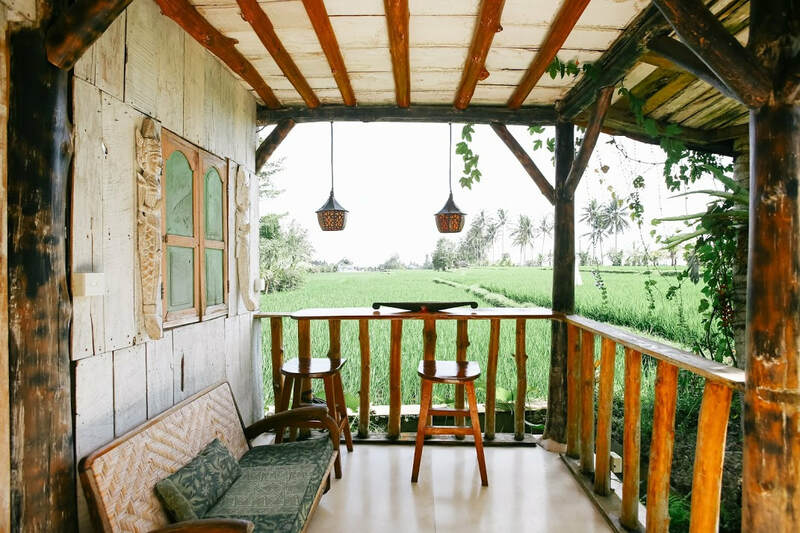 The Master Bedroom looks over the rice fields through floor to ceiling glass sliding doors, and its sitting area flows onto a private balcony. The large Master bedroom leads to the two other bedrooms. The second bedroom is adjacent, separated by a door, and looks over the tropical ravine at the back of the property. Above the Master bedroom on the top floor is the third attic-style bedroom. This bedroom overlooks the temple and mountains to the north. There is a partition-type wall separating the attic bedroom from the Master bedroom (the wall is not ceiling height, but still private). Note that all the bedrooms are adjacent, and the Master bedroom must be entered before entering the other bedrooms. At the front of the Treehouse, off the Master bedroom is another large balcony, with large outdoor living space and a treehouse bar to watch the sunset.